When I was six or seven my granny taught me to knit. I wasn’t very good at it and would just knit one long thing and because I always forgot how to cast off I’d end up leaving it unfinished. But my granny knitted really well and always had a bag or cardigan on the go and would knit us amazing things like Scooby Doo and Super Ted toys, she would put pencils in their arms and legs to make them straight which would often poke you when you cuddled them, but on the plus side could come in handy for some impromptu drawing. They lasted so brilliantly I passed them on to my daughter and even though she’s too old for them now, they can get passed down to the next baby in the family. I was thinking how nice it would be to make things to pass down through the family or to give as special gifts for friends’ babies, so I Googled knitting lessons and the first one that came up was Mrs Moon who, it turns out, are just down the road from me. 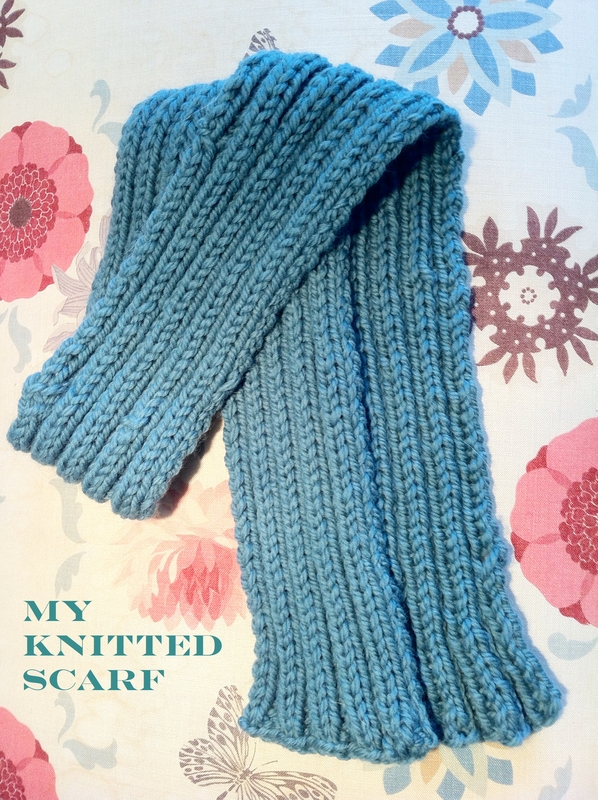 The beginners knitting patterns on the website looked so impressive that I booked a Beginners Knitting class. Sisters Karen and Susan opened Mrs Moon in 2009 and they’ve got some beautiful pattern books and yarn. In the shop they display a few samples they’ve made from the patterns so you can see what the finished product should look like. They also have a really gorgeous array of buttons. Karen led the beginners knitting class at the back of the shop and it was nice and cosy with me and just one other person so I got lots of one-to-one help with casting on, knitting, purling and casting off. I was very chuffed with the little square of knitting I had created and amazed at how it all came back to me, I had been convinced I’d forgotten the lot. So, full of excitement, I chose some yarn and knitting needles with the help of Susan so I could go off and knit a scarf. I’ve been a bit under the weather this week but that means that I finished my scarf in just two sessions (and caught up on everything that I had recorded that I’m not allowed to watch if anyone else is in the room – One Born Every Minute, Masterchef etc.). I popped back today for some red wool for a snood, I know it’s the wrong season but I don’t trust the British weather. To be honest, when I mentioned that I was going to learn to knit I got more than a little teasing about it. I went along to this class thinking I’d be really rubbish and that it might be a waste of time but I really enjoyed it. I’m going to do a couple more easy patterns and then I think I’ll go along to another of their classes so I can make something a bit trickier. Karen and Susan are so friendly and helpful and got me really excited about learning something new. Pop over to their website and have a look, if you order online before 1pm they ship your order the same day. To find a knitting course near you look at the list on the UK Hand Knitting Association website. Have you got any knitting stories?